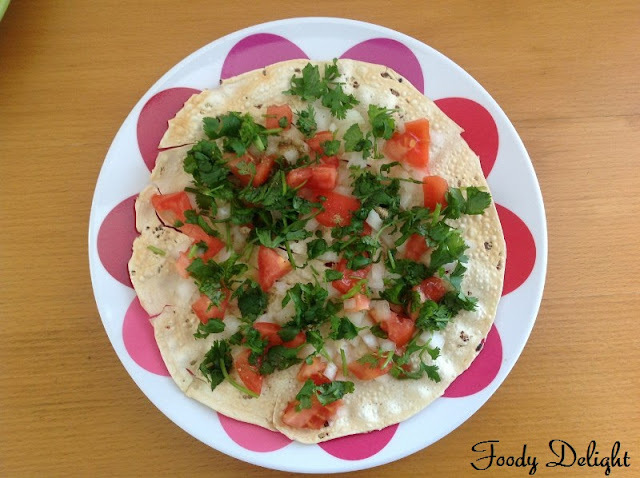 Masala Papad is the quick snack which can be easily prepared at home. This is the spicy version of fried papad, seasoned with different spices and garnished with tomato and onions. It looks so delicious and can be served as a starter or snack. Masala papad is a great alternative for plain papad can be enjoyed anytime and everytime. Roast the papad into microwave for about 30 seconds on each sides. Cut the onion and tomato into small chunks. Then add cumin powder,red chilly powder and salt into chopped veggies. Mix well. For more tangy flavour, you can add lemon juice into vegetables. Place the roasted papad on the plate. Spread the veggie mixture on the papad. Sprinkle chopped cilantro and pinch of chat masala. Here the masala papad is ready to serve. Masala papad can be served as the starter or as the sidedish with any pulav or pilaf. This is my favourite... Looks great.